St. Louis Car Accident Lawyer: Running A Red Light – Stop Sign Violation Cause a Car Accident? Running A Red Light – Stop Sign Violation Cause a Car Accident? Thousands of people in the U.S. are injured or killed because someone ran a red light. In fact, it is the leading cause of urban accidents. 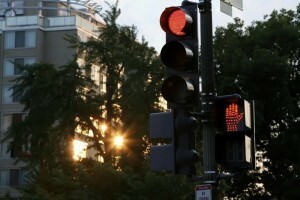 More than 1/2 of all American’s admit red-light running. More then 60% of American’s will see someone run a red light at least once each week. It is the leading cause of urban crashes. Almost all drivers fear being hit by a red-light runner. 1 in 3 American’s know someone that has been killed or injured by someone running a red light. When a person approaches an intersection with a green light, they assume it is safe to proceed. However, if another driver recklessly runs their red light it can result in an accident. What are some of the reasons people run red lights? Traffic lights and signals are there to protect drivers, pedestrians and bicyclists. When these signals are ignored, for whatever reason, the results can be catastrophic. Any driver that runs a red light and causes an accident should be held responsible for their actions. If you or a loved one have been injured due to another driver running a red light, contact The Hoffmann Law Firm L.L.C. today. We are dedicated to getting the maximum compensation for injury victims in Missouri and Illinois. After a serious injury or the loss of a loved one in a car, truck or motorcycle accident, you need to know that someone is on your side, protecting your rights and presenting an effective case to the insurance company. Without a strong advocate, you may not receive the financial compensation you need and deserve after a car, truck, motorcycle, bike or pedestrian accident. Call us today at (314) 361-4242.